The Oklahoman recently published what seems to be its annual story outlining all the problems with the underfunded Oklahoma Teachers Retirement plan, but this time it included an extra right-wing twist that should scare state educators even more. The bottom line is this: If you’re an Oklahoma teacher paying into the retirement plan and counting on a pension, you should be worried the prevailing, conservative political movement in this state may leave you with reduced benefits. That’s not hyperbole. 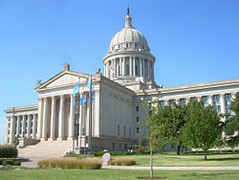 The story, “Oklahoma Teacher’s Retirement plan called substantially underfunded” (July 12, 2010), goes over all the same ground: (1) The retirement plan is the fourth worst public pension plan in the nation among 126 plans when it comes to funding. (2) The plan is funded at around 50 percent even though financial experts say it should be at 80 percent. There’s really nothing new here. Funding for the retirement plan, which includes teacher contributions, has long been criticized as inadequate. Many political leaders here have been more interested in cutting taxes for the wealthy than taking care of teachers and students in recent years. It’s also part of the state’s historical anti-education bias. What’s even the point of the article? Simply put more money into the plan.
. . . Anderson said it’s possible that eventually the teachers retirement system’s operating expenses could be reduced so that it would no longer need to receive 5 percent of state income and sales tax revenue, or about $260 million a year; as a result the state could look at using that revenue for other state services or to reduce or eliminate the state’s income tax. Note the language “to reduce or eliminate the state’s income tax.” Is Anderson serious? The state is really going to eliminate the state income tax by reducing operating costs of the retirement plan? When is that going to happen? And, even if the state could substantially reduce the operating costs, wouldn’t it make more sense to use the “5 percent of state income and sales tax revenue” to make the plan more solvent and thus solve the problem. The point here is that Anderson tries to conflate OCPA’s political agenda-starve the beast with tax cuts-with an extremely important issue for educators across the state, and teachers need to pay attention to this ploy because the state’s largest and ultra-conservative newspaper allowed his ideas to go unchallenged. Many Oklahoma teachers have paid into the system for years with the understanding that a pension awaits them upon retirement. Here’s the looming question: Will the state break that retirement promise in future years because of the type of political ideology espoused by OCPA? Teachers should be aware that the political ideas of the OCPA will have a lot more traction if the state elects a Republican governor and the GOP retains majorities in the House and Senate in this year’s election.